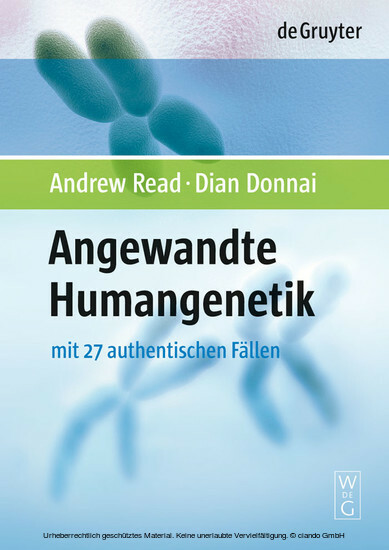 This book elucidates comprehensive, application-based knowledge in the field of human genetics from a scientific (Read) and clinical (Donnai) perspective. The respected authors, marvelous illustrations, the unique didactic structure and comprehension questions (with answers) have propelled this title on to the lists of numerous leading universities - including Harvard Medical School - in Britain and the USA. The editors of this licensed edition have adapted the translation to German circumstances and have added an additionalcase on sterility. Andrew Read,Dept of Medical Genetics, University of Manchester, UK, Dian Donnai, St Mary´s Hospital Manchester, UK, Olaf Rieß, Ärztlicher Direktor Humangenetik, Universität Tübingen, Johannes Zschocke, Institut für Humangenetik, Universität Heidelberg.